Chaminade College Preparatory is a private Catholic preparatory school with two campuses in the San Fernando Valley region of Los Angeles, California, United States. Named after Society of Mary founder Blessed William Joseph Chaminade, Chaminade College Preparatory consists of a middle school (encompassing grades 6–8) located in Chatsworth and a high school (encompassing grades 9–12) located in West Hills. It is located in the Roman Catholic Archdiocese of Los Angeles. It is a member of the approved Secondary Schools of the University of California. Chaminade College Preparatory was recognized as a National Blue Ribbon School in 1998. Originally called Chaminade High School for Boys, Chaminade College Preparatory was founded in 1952 on the former site of the Pacific Military Academy in West Los Angeles by members of the Marianist Province of the Pacific, who were seeking to expand their educational mission into Southern California. The school became nationally famous for the celebrity students who attended the school or came to its dances. The school's mascot name, the Eagles, can be traced to a tower at the school that featured an imposing Army Eagle emblem in tile, with the beak pointed toward the arrows as in wartime. The high school moved to its current location in West Hills (then part of Canoga Park) in 1961 after the brick buildings of the original campus were deemed unsound. A junior high school serving grades 7–9 was formed in 1967 when the former St. John's Military Academy in Chatsworth was leased by the school, expanding Chaminade's educational program from four to six years. A seventh year was added in 1989 with the addition of a 6th grade class to the junior high school; the ninth grade was moved to the high school campus that same year to accommodate the addition of the sixth grade to the junior high school, which would then become the middle school. The school became co-educational in 1972, with the first female graduates in the Class of 1974. Chaminade's two campuses served as the primary locations for the 1976 film The Pom Pom Girls. Grading The school year is divided into two semesters and classes meet every other day for 87 minutes. Chaminade issues three progress grade reports per semester; however, only semester grades appear on the student’s permanent record at the end of each semester, in January and in June. It uses a 4.0 grading scale as follows: A = 90–100, B = 80–89, C = 70–79, D = 60–69, and F = 0–59. Advanced Placement & HonorsThere are a total of 23 Advanced Placement and 18 Honors courses offered. In order to maintain a balanced course load, students are not allowed to take more than 8 year-long AP courses: 1 in 10th grade, 3 in 11th grade and 4 in 12th grade. In 2014, 473 Chaminade students took 911 AP examinations. Of the total exams taken 17% were a perfect score of 5, 22% were a score of 4, and 24% were a score of 3. With a score of 3 or higher, students may earn credit at many colleges and universities, it is also considered a passing score. In 1997, the Chaminade Varsity girls' soccer team won its first of four consecutive CIF Championships. In 1998, the boys' basketball team won its first of two consecutive CIF Championships. In 2006, The Varsity Lacrosse team won its first CIF Championship. In 2010, The Boys' Golf team won CIF. In 2013, the Boys' Varsity Football team won the CIF Championship, CIF Regional Championship and CIF State Championship. In 2014, the Boys' Varsity Basketball team won the CIF state championship.3rd State Crown this season. In 2014, the Boys' Varsity Fencing team won the California State High School Fencing Championships. In 2014, the Chaminade Wrestling team won 4 medals at the Mission League Finals. 1st, 2nd, 3rd, and 4th place. In 2015, the Girls' Basketball team won the CIF Southern Section Open Division championship. In 2015, the Men's Combined Fencing Team won the State Championships. In 2013, five Catholic orders released the confidential personnel files of a dozen priests and nuns accused of sexually abusing minors throughout previous decades. The files revealed that Priest Joseph DiPeri was accused of molesting a student at Chaminade High School in 1977-78. The school's administration was informed at the time, but no further actions were taken. A letter from an LAPD detective in the file noted that, "There was no mandatory reporting at the time of the alleged incident." In August, 2017, an unnamed teacher was placed on leave after school officials sent a letter home to parents informing them of "credible evidence," that inappropriate physical conduct between the teacher and student(s) had taken place. Chaminade did not name the teacher in the letter to parents, or in any other public statements. ^ a b WASC-ACS. "WASC-Accrediting Commission for Schools". Retrieved June 5, 2009. 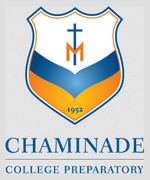 ^ "Chaminade Academic Profile 2014-2015". ^ "Chaminade Sports Have Come a Long Way - MaxPreps". May 9, 2011. Retrieved September 28, 2016. ^ "Past CIF State Bowl Game Championships Results and Records - California Interscholastic Federation". cifstate.org. Retrieved September 28, 2016.